Yesterday I made my way to the spiritual cafe for some sharing of great minds and great hearts around the topic of hope. 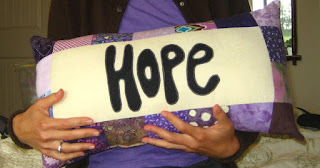 How fitting, given I sleep with this hope pillow every night?! I arrived at the cafe ripe and ready for a good discussion with my pillow in hand, and indeed I left with fresh insight and, you guessed it, HOPE. 1) "Never deprive someone of hope. It might be all they have." ~H. Jackson Brown, Jr.
What I love about this quote is the call for taking responsibility for one's life. It makes me want to make a t-shirt that says, "I do hope!". This quote sparked my first "ah-ha" of the afternoon. Insight # 1: Hope is a state of being, from which all action stems. (hey, that can be my quote!) As I see it, hope is always innately within each of us and can be used as a tool for manifesting your destiny. The pitfall lies in attaching to specific outcomes, as we can make all the plans in the world and then life happens. Hope is about being open to what we can not predict. The less we can invest in a particular outcome, the more open we are to infinite possibilities. Insight # 2: When feeling hopeless, and likely we have all been there at some point, this can be viewed as a signal for the need for change and/or a new understanding of one's situation. Insight # 3: Hope creates intention and intention creates hope. As I see it, when one is being hope there is space for new intentions to be born. Likewise, when one creates an intention, this breeds a sense of hope. I was amazed by the depth of conversation that transpired in relation to hope. Too, I loved hearing all the different perspectives from various people in the group. When a bunch of minds and hearts gather, expansion is inevitable. I look forward to more wonderful discussions and idea sharing; it is surely a great way to create and sustain community. Thanks to Sarah, Serina, and Robert for your consistency in organizing these lovely little events. What a lovely group of friends you must have! I love the topic. Hope is something I have really struggled with over the last few years. When my mom was diagnosed I put all my energy into "Hope". The word hope is used by the Canadian Cancer Society. However, time and time again our hope was taken from us. Though I ache every day for my mom, it was a relief to finally give up hope. I know this sounds opposite to the what you are writing about here and it is. I am really working on getting hope back into my life but it has been a struggle. Not too long ago I could not even look at the word hope without feeling anger. I thank you for this post. It has given me something to meditate on and think about. No matter what my feelings are on hope, I know I need it. And I love you pillow! This makes me think of the author, Elizabeth Kubler-Ross, who wrote the book "On Death and Dying". Oh, How I Love the Tarot! Come One Come All to Courtenay, BC this Saturday! Living passionately from the heart and committed to my soul's highest divine purpose for the greatest good of all everywhere.